Taking inspiration from the coast, our beach house look takes elements from nature combined with familiar sights from the seaside, designed to invoke memories of the beach and create a relaxing and calming space, be it a beach themed bedroom or a coastal themed bathroom. This look can be paired down using just the neutral tones of grey sand and blue or textures like rope, rattan and driftwood or embraced for a full nautical theme with boats, birds and beach huts. Raw and distressed woods pair with shells and pebbles to create a rugged natural unfinished feel, perfectly suited to a bathroom or bedroom to create a calming interior space. The Beach House look is perfect for any room where you want to relax and unwind. Inspired by the colours, textures, inhabitants and objects of the coastal landscape this style is both simple and yet satisfying to create. Whether you plan to transform your bedroom into a tranquil island retreat or decorate an entire home. This nautical home look can be created in any room in the house using neutral subtle tones or by using bold coastal accessories and wall hangings. The colour palette of the seaside home decor are made up of colours that you see at the beach, warm yellow sand tones, greens and blues of the sea and sky, the whites of the clouds and the greys of the pebbles. 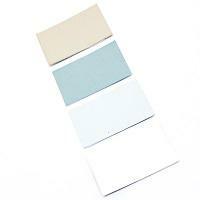 It is always advisable to choose 3 colours for your scheme for example grey, linen and teal. Choose your shade of blue or green and try not to mix this, all shades will work from turquoise to navy but not together. Pick one or two colours for your walls, ensure your flooring is tonal to the scheme. 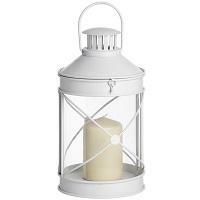 Then use the remaining contrast colours combining beach themed home accessories. Using white instead of linen will give a fresh feel. 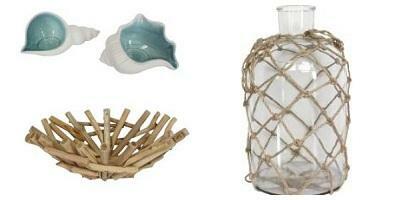 There are so many beautiful nautical and coastal home accessories to choose from to create a beach house style look. We combine textures such as rope, driftwood, sand or pebbles to remind of the sea and give your house a subtle seaside feel without creating an overpowering beach house look. Use your chosen colours and incorporate stripes, birds, boats or beach huts to invoke memories of the sea. We have wooden plaques with beach related messages like “my heart will always be beside the sea” or vases filled with shells and starfish. For more practical yet stylish and minimalistic coastal themed home decor accessories, look no further than our elegant and chic collection of ceramic and stoneware mugs and jugs. 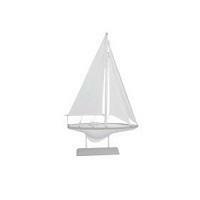 Candle holders made from driftwood or rope and simple boats and birds are perfect way to add a finishing touch. It’s important to keep your coastal house look furniture as minimalist as possible when adding furniture. To achieve this it's best to contrast the colour with your walls as this will ensure that the furniture stands out and look effective. Try combining rustic wood and chunky furniture with clean lines for a great look, and also furniture with baskets instead of drawers for a rustic raw finish. Washed wicker, rattan and rustic wooden and chunky furniture can help creating a coastal chic look. Washed wicker and rattan storage furniture is the perfect solution for smaller homes as it doubles up as a storage unit which is ideal for storing bits and pieces creating a simple look. White or linen coloured compliment blue, teal or grey walls. Chalk paint can be useful if you want to change the colour of your furniture. Take a look at our vintage paint range, we recommend that you try linen, earl grey, shutter or summerhaus to create a beach house style. 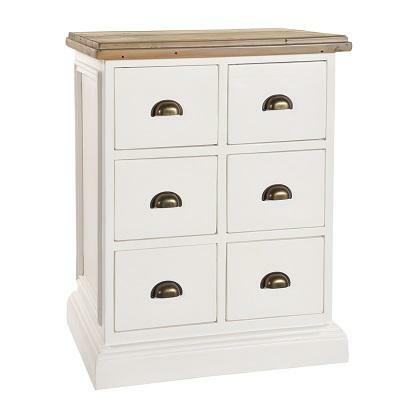 We love furniture with a wooden top and cup handles in crisp white, like our Hampton furniture range to create the look or alternatively our Boston range in off white looks perfect with its seagrass drawers. Neutral tones, driftwood, rope and rattan textures, distressed and raw woods are the key elements of our coastal chic decor furniture collection, that will perfectly suit on a beach themed bedroom or living room!